Some of the action I caught on my camera. I attended my first Montreal Impact game of 2014 on June 4 at Saputo Stadium and I did not go home disappointed. This has been a frustrating season thus far for our franchise in Major League Soccer, with a disappointing 2-6-4 record. On this night they defeated Toronto FC 1-0 in the Amway Canadian Championship final. By virtue of a 1-1 draw in game one versus Toronto, a hard to understand formula meant that Montreal only needed a scoreless draw to advance to the group stage of the CONCACAF Champions League, the annual club competition featuring 24 teams from North America, Central America and the Caribbean. This was the type of game that makes one want to return for more: end to end action, lots of physical contact, a rowdy crowd and excellent ambience. There is a rivalry between Montreal and Toronto and it showed. Head coach Frank Klopas looked as if he was behind the bench for the final of the World Cup, pacing back and forth and repeatedly berating the officials for missed calls. And why not? Advancing in an international tournament is a shot in the arm for a team performing poorly. It was a player who just goes by the name “Felipe,” who scored a sensational goal at the 90 minute mark that lifted the crowd to its feet after sniper Marco Di Vaio had hit the crossbar. Felipe broke the rules when he pulled off his shirt to celebrate, receiving a yellow card from the official. With the Canadiens season over and the Canadian Football League possibly looking at a strike, the Impact may be the only game in town. If you have not seen a game yet, you are doing yourself a disservice. The stadium, which has been refurbished since its original opening in 2008, is gorgeous and worth attending a game for all by itself. If the Saputo family had owned the Montreal Expos, baseball would have still been here for they would likely have built their own stadium here. Joey Saputo is as a dedicated a team owner you will find. His family poured $7.5 million alone for the construction and then came up with the countless millions necessary to enter the MLS. The in-house entertainment are the Ultas fan club. They sit behind the net near the entrance to the stadium, chant en masse the entire game and even light flares at a certain point. For this game it began to rain during the second half. Many of the seats are covered by overhangs so in the case of my group, we did not get wet at all. I would like to see the Impact have a living human being sing the national anthems and come up with a way to enhance their physical presence in the West End of town where many, many potential fans wait to be courted. Saputo Stadium is directly next door to Olympic Stadium. There is plenty of parking and a slew of restaurants to choose from along Sherbrooke Street East. One of those is the first Dallas BBQ franchise in the city. 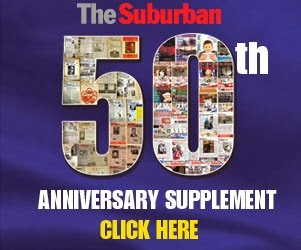 It is on the site of a former Scores and has a very similar format and menu. I urged the manager Tim, who resides in Snowdon, to take a look at Sherbrooke Street West in NDG and some vacancies. A Dallas BBQ would look pretty good there. The Impact’s next game is June 11 (7:30 p.m.) when they host D.C. United at Saputo Stadium. Why is it that the West Island does not have a regular dose of stand up comedy? Well, for two nights at least the Holiday Inn Pointe Claire will be the home to two extraordinary shows headlined by the one and only Franco Taddeo. The Saturday, June 21 program is sold out and it likely that tickets for the following evening won’t last long either. 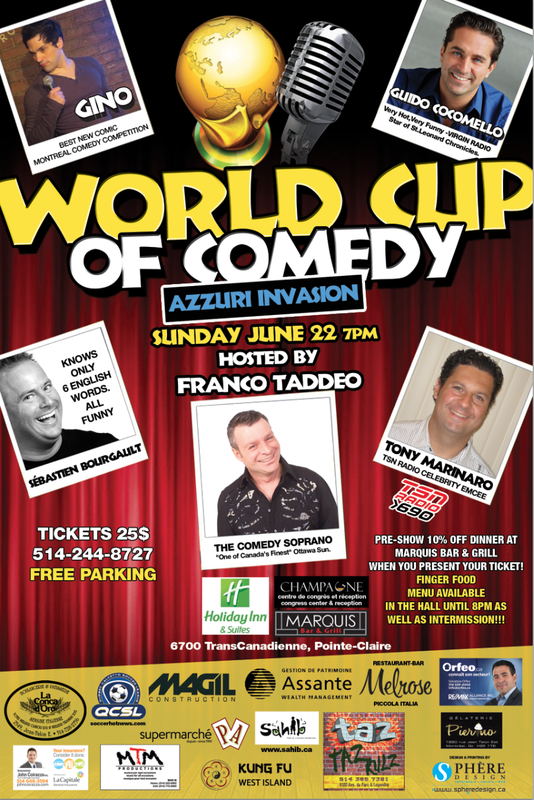 The World Cup of Comedy will also feature TSN 690’s Tony Marinaro, Sébastien Bourgault. “For years now I have had club, hall & location owners offering me their rooms to star and produce a show in,” Taddeo says. “I have been too busy touring and doing shows for others. I felt now, the time was right. I wanted a theme show that was fitting for the time of year and created buzz. What's bigger and engenders more passion than the World Cup? Having it on the West Island was just the icing on the cake - it is accessible, always has parking and is an under served comedy market.Win Win & Win!! Here is a YouTube preview. Check the poster below.